The Metro Center has the capacity to examine the complex and diverse economic landscape of the metropolitan region and the strategies for, and impacts of, growth. Topics may include community focused economic development feasibility studies and strategies, e-commerce, regional food systems, and metropolitan agriculture, or sector analysis and competitive advantages. The Metro Center assists local governments and non-profits with data driven decision making and the creation of sound and equitable policies and systems. Our work includes public policy as well as operational policies and procedures for public and private organizations. The Metro Center works with organizations to improve effectiveness, develop leaderships, and engage in sound strategic planning, helping them become learning organizations that can sustain transformation and remain competitive. Professional development training, such as our impactful Poverty Immersion Workshops, help organizations become more responsive to a diverse clientele. The Metro Center can assess the effectiveness and impact of projects, programs and policies through both quantitative and qualitative evaluation, including innovative community based methodologies such as Ripple Effects Mapping. We can also design systems and provide training to allow organizations to conduct their own evaluations in the future. The Metro Center utilizes faculty expertise to design educational and professional development programming in multiple subject areas and communication modes, such as the online STEM Mentor Training, Grant-making & Request for Proposal Development Services, and Business Ecosystem Services. We work with our clients to meet the needs of their organization or to develop educational programs, for their external clients. 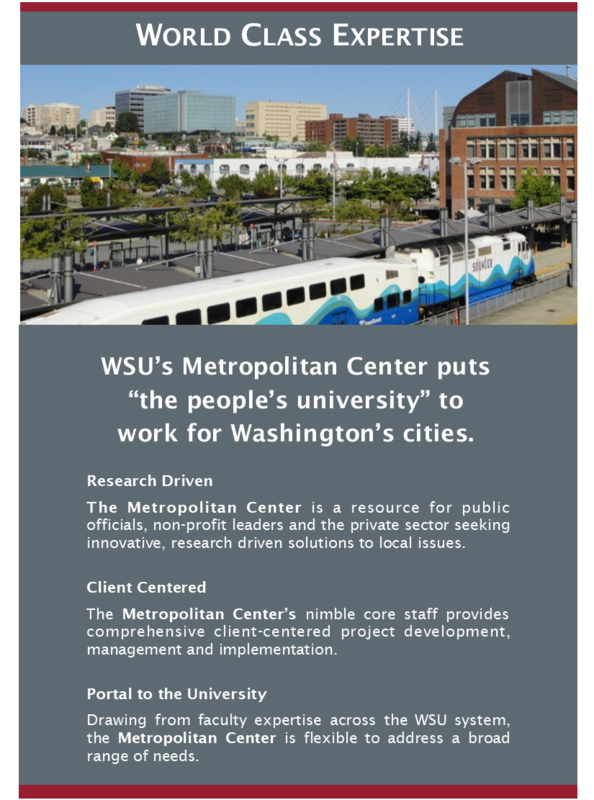 The Metro Center leverages faculty expertise and WSU’s state-of-the-art computing infrastructure to provide customized solutions in data collection, ‘big data’ processing, and analytics for public and private entities across Washington State. Our faculty deploy specialized skills in informatics, complex systems modeling, GIS, and machine learning to help organizations make sense of complex information more efficiently and improve strategic planning and decision-making.